Science Project _ Compare copper wires to optical fibers for transmitting sound, image or data. As time passes, more and more communication systems use fiber optic cables instead of traditional copper wires. 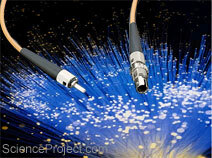 Using optical fiber to transmit sound or data is much more complex than using copper wires. Optical fibers are not easy to work with. They require special equipment and trained technicians for cutting and making connections. On the other hand you can cut copper wires with any pair of scissors or pliers and they can be connected easily. With so many difficulties in using fiber optic lines and no obvious benefit, why do we use them? In this project you compare optical fibers with copper wires for transmission of sound or data. Your experiments may measure signal degradation or noise as factors that may affect our choices in selecting a transmission media. The experiments in this project do not need and use any optical fiber. Instead you perform experiments to show problems with copper wires. You focus on problems that obviously cannot exist with optical fiber (because of the nature of the light). This project may not be acceptable to many teachers and schools because it contains no experiments with actual fiber optic lines. The equipment needed for testing fiber may exceed $25000 in value and require knowledge and expertise that are not available to young students. That is why in this simplified project the experiments only show the problems with copper wires. More details or support for this project is available for the members of ScienceProject.com. Material needed for experiment can be purchased locally or ordered on the Internet.